Big Bend National Park is easily in my top 5 National Parks that I have visited (I'm currently at 51/59). Seclusion, dramatic views and a sense of being on the border of Mexico are all very prevalent. Along the Rio Grande you are literally a stones throw away from Mexico. It’s always a great feeling when you spend multiple days in a park and feel you could return and do so much more. One of my all time favorite vistas so far has been along the South Rim Trail at Big Bend. Hiking solo, I thoroughly enjoyed the seclusion along this route and I highly recommend this trail if you ever visit. In order to complete the South Rim loop you have to connect a few trails including Laguna Meadows, Boot Canyon and Pinnacles. Somehow, I also managed to add Emory Peak into the mix for a 5 trail, 16+ mile, 3,000 elevation gain day-hike. Be forewarned, I would not recommend doing this all in a day if you are unsure of your own capabilities. There is no shade, you are exposed to cliffs at times, it gets hot quickly during the day and Emory Peak is the 2nd highest peak in Texas (Guadalupe Peak, another amazing hike, is the highest and is located in Guadalupe Mountains National Park.) However, the payoff from the views along the South Rim alone are well worth the challenge. Emory peak is totally optional and not on the loop. Start at sunrise! Although I was pretty proud of myself to accomplish this all in a day, after seeing the views from the South Rim I was envious of the campers I passed along the way. One of the unique opportunities about being on the border is crossing into and visiting the small town of Boquillas, Mexico (population ~110). After questioning two different park rangers regarding the safety of this area I was told by one “I’ve been to Mexico and I have no desire to return” and the other ranger was more informative and ensured me she had traveled over there by herself with no problems. She essentially said it was extremely safe because all they have in this town is tourism (with only an average of about 35 people a day crossing over) and they can’t afford to lose that. The next closest town to Boquillas in Mexico is 160 miles away, which is also where the nearest hospital is located and where a truck comes from once a week to deliver groceries and the alike. Thanks to a recently installed solar farm, the town now has electricity for refrigeration. At many of the overlooks and pull offs along the river you will find various crafts that are available for purchase. These items are illegal contraband according to the park and you are discouraged from buying or interacting with anyone selling these items. According to Edgar’s interpretation of the rules, the park rangers actually don’t care as long as they aren’t soliciting or bothering the park visitors. He claimed the residents in town would take turns crossing the river in the early morning, set up their shop for the day (with a cup/box to deposit money) and then return to collect it at the end of the day. You can literally see some make-shift shelters across the river where one could hang out and watch their stash of “crafts”. The river is quite narrow (and low when I was there) that in some points the border almost seems artificial. A few strokes/steps and you are on the other side. This might worry some of you as you are thinking border security. However, all roads leading out of Big Bend National Park have full time border patrol checkpoints (with dogs) and the surrounding areas are quite desolate. Further up the river in the park is the very impressive Santa Elena Canyon (another great hike) and the Sierra Ponce Cliffs which reminded me of a Game of Thrones-esque wall. Good luck crossing that! I really enjoyed my time at Big Bend National Park. There were still many trails that peaked my interest that I did not get to do including the Boquillas Canyon where you may come across Singing Jesus. Here you will find a man who will sing to you across the canyon/border if you leave him a donation in his jar. As with every park I have visited, Big Bend offers some truly fascinating and unique experiences! 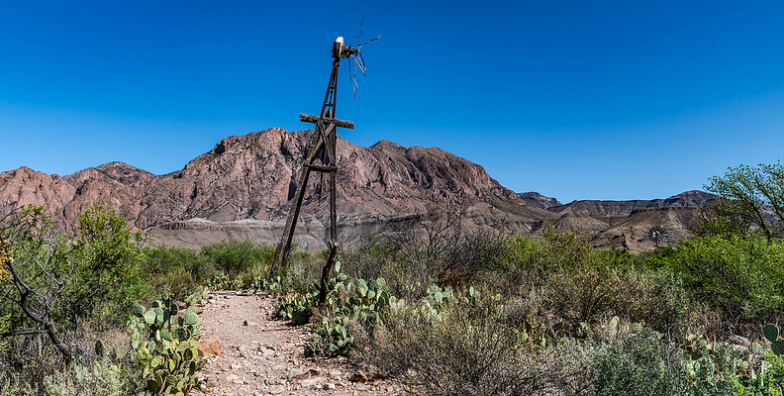 Have you been to Big Bend National Park? Or want some further tips on going there? Comment below! Thanks for being a part of the crew, if you sign up in the footer with your email address you'll get all our latest happenings PLUS a free automatic entry into our quarterly print drawing! We also have a March Outdoor Moments Contest going until March 31st, more info HERE!